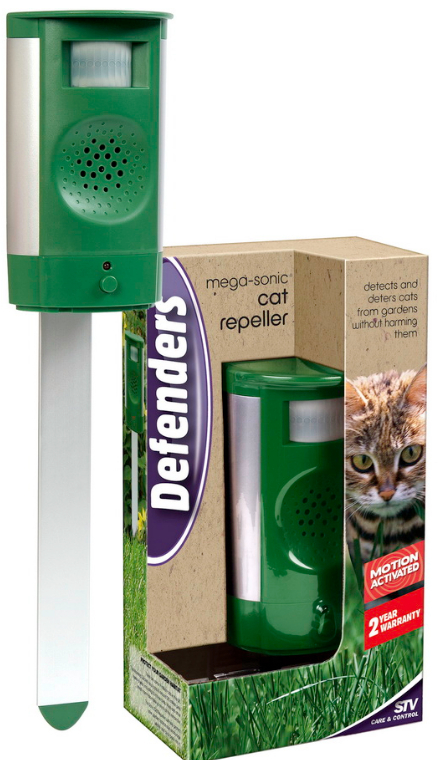 The best selling STV Ultrasonic cat repeller / deterrent is designed to stop cats from fouling in your garden. When the unit cat repeller detects movement, it emits an high pitch ultrasonic sound that cats don't like and so they move away - very quickly. The ultrasonic cat repeller / deterrent doesn't harm cats at all, it simply produces a noise a cat wants to get away from. Humans can't hear it and it doesn't affect birds. This STV ultrasonic cat deterrent has a 30ft range. Without the optional mains power adaptor the PIR sensor extends the battery life, only actuating the it detects movement. The cat deterrent has a test facility to ensure it is working correctly. 10 Mtr range over 98 degree arc, giving a total of 120sq mtr coverage. 'The ultrasonic cat deterrent / repeller was easy to install and operate. The first cat took one look, ducked, then fled! My kind of pest control!' - Michael, Birmingham. 'Fantastic! I brought a ultasonic cat deterrent was well worth the money. My garden was a place where cats pooed a lot and now its smells a lot fresher and I hardly see a cat! Brilliant Product and Thank you!' - Natalie, Dudley.